Sabal Cove Spring Run At The Brooks Condos: NOW $333,500. Hurry, Must See, Just bring your suitcase. Two br, + Den, 2 bas., attached Villa w/2 car garage in sought after Sabal Cove. Furnished Villa Home with Great View of Lake and Golf Course. Enjoy the Refinished Pool, Deck, & Newer Paved Lanai. Fabulous Sunsets. Electric & manual hurricane shutters on all windows & doors. Plantation shutters, SS appliances, ceramic tile & laminated wood. New hot water heater Aug. 2018, HVAC maintained on regular basis, Lg. Walk-in closet in Mstr. Br. Guest Br. has ensuite bath + closet, Den/3rd br. with dry bar. Spring Run is a Bundled 18 hole, golf community, with a newly renovated Clubhouse offering Fine Dining, Bar & Grill, Pro-Shop, Bocce & Tennis Cts., Pool & Spa. Lee Emergency Hospital is 5 mins. away, 20 minutes to Beaches & SW Fl. lnt'l Airport. Membership avail. To Private Beach Club, Fitness, Spa & Enrichment Center, plus The Rookery Rest. Short distance to Coconut Pt. Shopping, Restaurants, and Entertainment, Miramar Outlets & Gulf Coast Town Center. Spring Run is an active & financially stable community with a wide range of amenities & social activities. A must see! Autumn Lake Spring Run At The Brooks Condos: WOW, if you want Lifestyle, this 2 bedroom + den, 2 bath Spoonbill floor plan end-unit is seeking a new Owner. This unit is in the highly desirable Autumn Lakes area. Here you are able to sit on your screened lanai and watch the golfers during the day or pull the shades and enjoy the gorgeous sunsets by evening. This unit has been professionally painted, has high ceilings, carpet and tile flooring. The Community boasts a Greg Lewis designed 18-hole golf course and pro-shop, a Clubhouse with a state-of-the-art fitness facility, a dining room and grill room, card rooms and a library. There are 4 Har-Tru tennis courts a heated community pool and spa. Spring Run is close to the Coconut Point Mall with fabulous retail shops and dining venues as well centrally located near the fine dining establishments, cultural attractions and professional sports of both Fort Myers and Naples. The sugar sand beaches are nearby as well or join the Commons Club which boasts extra amenities as social events, a restaurant, classes and seminars and a private beach. Commuting through SWFL Regional airport is a breeze. So, come on down and enjoy life. The Seller is motivated and soliciting offers. Hidden Lakes Spring Run At The Brooks Condos: It’s all about the view in this incredible Spoonbill model being offered Turnkey! With a large all-season lanai offering amazing views of the 13th and 15th holes and a Southeast exposure, you’ll want to spend all your time outside. Tastefully decorated offering Old-Florida charm with everything you need to enjoy one of Southwest Florida’s best bundled-golf communities. Bring only your suitcase and you’re ready to hit the links and beach! Eye-pleasing neutral paint scheme with high-end window treatments, plantation shutters, crown molding and a brand-new master shower, this charming, 2-bedroom, 2-bath, plus a den carriage home with a single car garage is just what you need. Plenty of space to entertain your guests in this amazingly cared-for, pristine beauty. Come see it today! Hidden Lakes Spring Run At The Brooks Condos: Perfect Location Condo near the pool and with a Golf Course and Lake View! Turnkey Furnished for your convenience and ease of ownership. Click on the Virtual Tour for pictures of the 45+ Artwork and Decorative Items being left! Light and Bright southern exposure makes this home a joy to live in. This Comorant model is the largest floor plan available in Spring Run and features a kitchen that is designed with entertaining in mind! High End Furniture from High Point, NC is included with this property. NOTE: Seasonal Tenants already Available for 2020 Season if desired! This bundled Golf community features 18 holes of fantastic golf on the Gordon Lewis designed course. The community amenities also include Har-Tru Tennis courts, Community pool, Community Spa, Bocce Ball courts, a Grill & Bar, Library, Pro Shop and Fitness Center with Personal Trainers on staff. Optional Beach Club is available at the nearby Commons Club. Located on the center of one of the fastest growing areas of SW Florida with activities and entertainment venues close by. Autumn Lake Spring Run At The Brooks Condos: Spoonbill living at its BEST! Superb location walking distance to the club and steps away from the community pool. Everyone loves this great room living space with 2 Bedrooms, Spacious Den, 2 Bath and 1 Car Attached Garage. Enjoy your morning coffee with the sunrise and your afternoons with shade. Mile wide lake views overlooking the 9th fairway and Clubhouse. Features include tile in all living areas including the lanai, Turnkey living, granite kitchen countertops, raised panel cabinets, smooth top surface stove, new front door, attached garage with direct entry into the coach home, a newly installed Nest wireless programmable thermostat, end unit with fabulous natural light, living space is nice and wide feels like a villa. The kitchen and great room are open and fabulous space for entertaining. Spring Run is a bundled golf community with all the lifestyle amenities included in the purchase of the home. All the Fun includes - Golf, Tennis, Resort Pool, Bocce Courts, Clubhouse with Restaurant and Bar, Complete calendar of Social Events, BBQ Grills, gated community and the Commons Club Availability. NEW ROOF AND NEW EXTERIOR PAINTING HAPPENING NOW-SEPTEMBER 2019. Autumn Lake Spring Run At The Brooks Condos: STUNNING - This is for sure one of the most outstanding 2nd floor condos in this area, located in Spring Run at the Brooks. This condo looks like a newly built and staged model home - with thousands of $´s spent on upgrades. New remodelled bathrooms with granite tops and glass bowl sinks, new engineered vinyl plank flooring in living room, kitchen, hallway, and bathrooms. Plantation shutters in bedrooms, den, and kitchen. New top quality shower-door in master bathroom. Wonderful ceramic tiles on the large lanai. A great deal for this 1,800+ sft home, including an attached garage. But there is more, appliances, air handler and A/C are also up-to-date and have been replaced 2015 - 2017 - there might not be a better deal in the future - not even close! Also - Enjoy the westerly view on the Championship Golf Course, which represents the best value in bundled golf communities with low fees and fabulous amenities in SW-Florida. Spring Run offers the Commons Club with 3 levels of membership, the Commons Club features many activities including outdoor concerts, movie field trips, a state of the art fitness center with an Olympic sized pool, private restaurant and a private beach club. Autumn Lake Spring Run At The Brooks Condos: Beautiful 2nd floor residence filled with sunlight and peaceful lake views. One of the most popular floor plans in Spring Run ( The Cormorant Model) , featuring an open and spacious floor plan with over 1800 sq ft under air, two bedrooms plus a den, split floor plan and vaulted ceilings. Impeccably maintained and updated, upgrades include plantation shutters on all windows, solar tint on windows and lanai sliding glass doors, enclosed tiled lanai for year round use, updated kitchen in 2016/2017, new washer and dryer 2018, just to name a few! Within walking distance to the clubhouse and across the street from community pool. Spring Run offers an array of amenities including a Gordon Lewis designed par 72, 18 hole golf course with five sets of tees that cater to every skill level, four clay tennis courts, bocce ball, a 15,000 sq ft clubhouse offering fine and casual dining, fitness room and pool. Memberships available to The Town Center and Commons Club offering access to the Brooks Private Beach Club on Bonita Beach, Fitness & Spa, Enrichment Center, & Rosie Spoonbill Restaurant. Hidden Lakes Spring Run At The Brooks Condos: Enjoy the fantastic lake and golf course views from this 2 bedroom/ 2 bathroom coach home which offers 1,376 SQFT of living area. Great location on a quiet cul-de-sac with extra parking and just steps from the barbeques. There is large tile throughout living area including the lanai. Offered Turnkey Furnished. Spring Run is very Active offering a wide variety of Amenities & Social Activities. The Clubhouse amenities include casual and fine dining, Lighted Tennis courts, Bocce Courts, Fitness Room, & Large Pool & Spa. PRIVATE BEACH CLUB MEBERSHIPS AVAILABLE. Centrally located within close walking distance from Coconut Point Mall, 15-20 minutes to the beach and International Airport, Gulf Coast Town Center, FGCU, Miromar Outlet Mall & Hertz Arena. Sunset Stream Spring Run At The Brooks Condos: Great Location Turnkey-- open floorpan 2 bedroom 2 bath residence move in ready. Golf Course view Great community and amenities and Golf Membership. 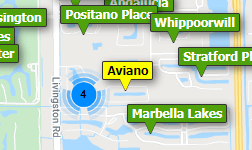 Close to FGCU, Coconut Point, Miromar Outlets, Gulf Coast Town Center, SWFL Airport, I75 and the Beaches. Autumn Lake Spring Run At The Brooks Condos: This immaculate Heron with 2 bedrooms and 2 baths, one car garage has a great view of the 8 hole in Spring Run. Additionally this unit comes turnkey and has an enclosed lanai for year around comfort. Spring Run is a bundled golf community with fitness center, tennis courts, bocce courts and many activities in the clubhouse. Sunset Stream Spring Run At The Brooks Condos: Very well maintained bright and light spacious golf inclusive first floor condo. All tile floors including lanai. New washer, dryer, dishwasher, TV's and fans in late 2018. Great seasonal rental or full time residence. Overlooking golf course and steps from the pool. Very active community. Quick possession!! Streamside Spring Run At The Brooks Condos: C.14818 - REDUCED! GREAT VALUE and MOVE-IN-READY to this beautiful & immaculate custom decorated & turnkey furnished condo with fabulous GOLF COURSE & LAKE VIEWS from tiled lanai that also has an electric hurricane shutter for quick protection & safety! This 2nd floor Heather model has MANY UPDATES including: wood kitchen cabinetry, exquisite GRANITE counters & tile backsplash, 2018 DRYER, NEWER washer, refrigerator, dishwasher, and 2018 AC UNIT. This open,airy & bright condo has LARGE TILE ON DIAGONAL in all common areas, looming vaulted ceiling in great room, pull-out sofa, recently REPLACED CARPETS in master & guest bedrooms and entry stairway! Master Bedroom has a large tiled walk-in closet and Water Closet with wall cabinet & wood detail. Guest bedroom has crown molding. Spring Run is a financially stable, BUNDLED 18 hole golf community with clubhouse, restaurant, bar, many social opportunities, Fitness room, tennis & bocce, more! PRIVATE BEACH CLUB available. Centrally located to Naples, Ft Myers/Sanibel. Min away from Coconut Pt Mall, 20 min to beaches, SW Int’l Airport, fine dining, shopping, Miromar Outlets, Gulf Coast Town Cntr, Germain Arena, FGCU. Streamside Spring Run At The Brooks Condos: C.16032 - Located on the 18th fairway you will have great views of the golf course and lake. This unit is within walking distance to the clubhouse. This 2 bedroom, 2 bath mode is begin sold turnkey. Just bring your golf clubs and clothes. It ha a new refrigerator and a/c unit. The bathroom floors and commodes have also been replaced. This is the ideal unit to es cape northern winters and extend your golf season. Spring Run offer both tennis and bocce ball. Don't miss an opportunity to see this unit. Winding Stream Spring Run At The Brooks Condos: Are you tired of seeing snow and slush out your window, this second floor home has the perfect golf course views to make your morning coffee extra special! Home has just been updated with new paint and carpet throughout. Large kitchen offers plenty of eat in space, as well as a breakfast bar and a formal dining area. Open floor plan that will make hosting as fun for you as it is for your guests. The screen lanai is large enough for any outdoor furniture arrangement you might want. Master bedroom has a walk in closet that can easily hold all of your clothes, no need to borrow space from your guests. Ride your bikes to the community amenities, or just a few minutes more to all that Coconut Point Shopping Center has to offer. Winding Stream Spring Run At The Brooks Condos: Enjoy one of the best water, then golf views in Spring Run. Lowest priced Gardenia in Spring Run with a fantastic view. Original Owner has never rented. Kitchen counter has been redone with upgraded formica and dome lighting has been renovated with new lighting. A/C was replaced with high end unit in 2010 and Water Heater is also high end in 2011. The Brooks Common Club offers a private beach club, additional fitness center and also members only dining at The Rookery. Come see your new home and feel the cozy feeling you've been looking for.